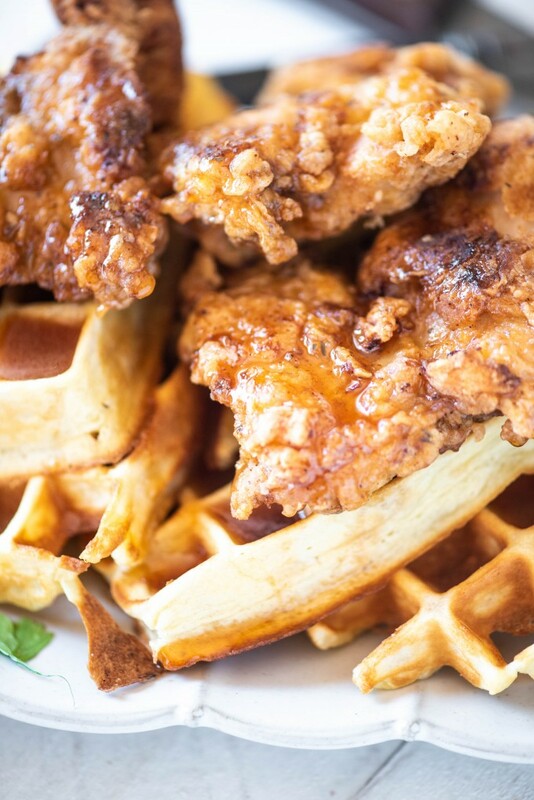 Have you ever had chicken and waffles? This brunch staple is crispy outside, tender inside and topped with a drizzle of irresistible sriracha honey! Somehow I made it to the age of 32 before I ever had chicken and waffles. I’m assuming that this is something that originated in the southern half of the U.S., because I can tell you with all certainty that I’d never heard of the concept until a couple of years ago. Truth time- I thought it was super weird. Waffles belong with syrup. Why are we trying to top them with fried chicken? Fried chicken belongs with mashed potatoes. Why do we have to muddle up food? Why can’t we just leave things be? Well, consider me a reformed bruncher and food-muddler. After David and I moved back to Cincinnati, our opportunities to go out together (date nights, if you will) increased exponentially. We were dying to do things without shelling out $100 a night for babysitters, and a plethora of grandparents were chomping at the bit to make up for years of living away from their grandsons. One of the things that we have missed most was going to movies, and lucky for us- CineBistro had just opened up a new location not even 10 minutes from our house. When I go to a new place, Dave will be quick to tell you that I go just a little nuts on the menu. I’m a classic over-orderer. I can’t help it, I just get so damn excited. I know on this particular day, we ended up ordering a couple appetizer, two entrees and at least one dessert. Classic over ordering. 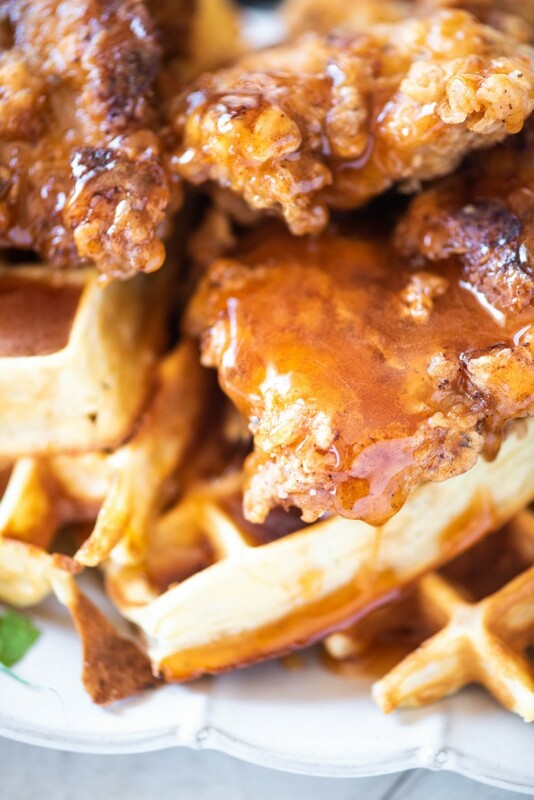 One of the entrees was their spicy chicken and waffles. Their chicken and waffles was so freaking amazing that I was super bent out of shape that I had to stop eating it halfway through and trade entrees with Dave. To be sure, theirs was assuredly better than mine. I can’t be sure what exactly was on it, since the movie had started and it was dark, but I know that the outside of everything was super crunchy, the chicken was juicy, the waffles were fluffy, the tobasco honey over the top made the whole damn thing work, and that I had to make it at home as soon as possible. Here’s what I don’t know though- is this a brunch dish, or dinner entree?? 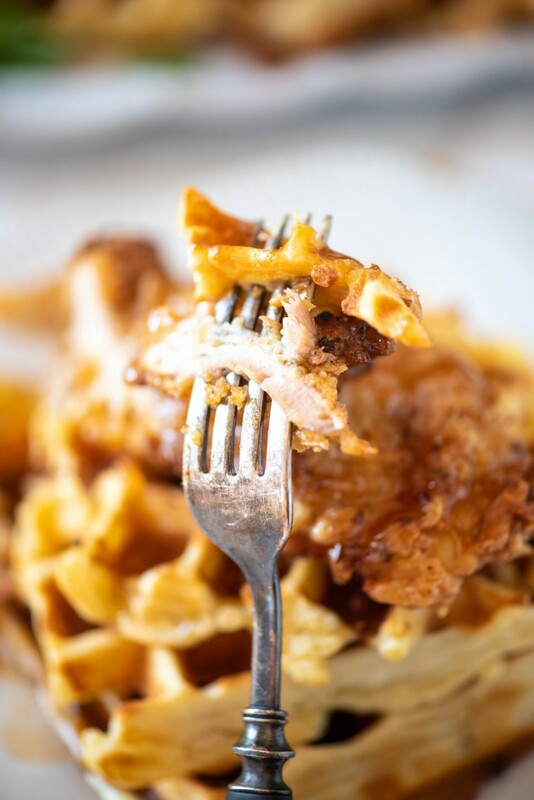 I used my favorite Belgian waffle recipe for the waffles, and created a flour coating for my beloved boneless skinless chicken thighs. I opted to use the thighs because I can’t seem to find any non huge, tough, tasteless chicken breasts anymore, so I have mostly switched to the better brother of the chicken breast. You’ll have to really convince me that the breasts are the way to go here. I wanted to keep this as simple as possible for all of you at home, because let’s get real- it’s already a more involved recipe. This is probably why people order this at restaurants. However, rest assured, the effort is worth it. Mixing bowls– for mixing up your batters. Waffle Iron- I am obsessed with my waffle iron from All Clad. I swear it makes the best waffles in all the land (well, outside Disney World). It’s pricey but mine is still in perfect working conditions after 8 years. This is a less expensive version that has good reviews. Large deep skillet– my personal preference for frying in this recipe. It keeps the chicken almost fully in the oil, but doesn’t crowd the chicken. Oil thermometer– preferable for getting the oil temperature just right. 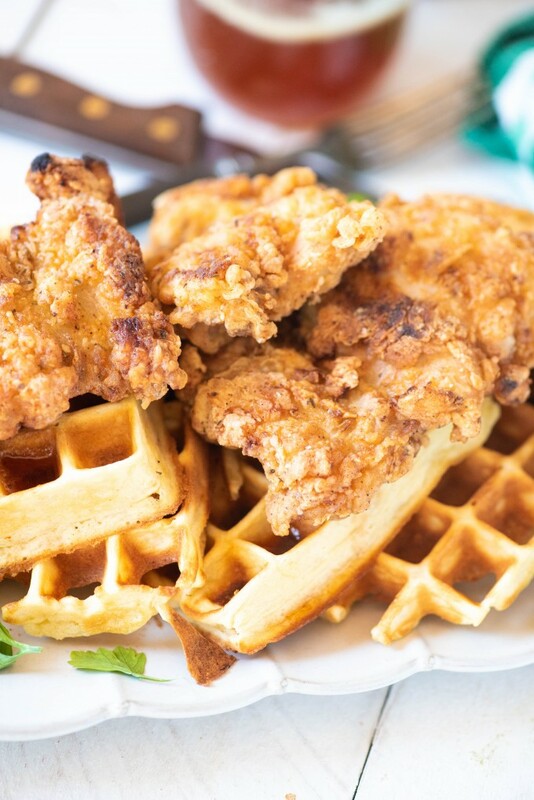 This easy, Southern-style Chicken and Waffles recipe is perfect for your next brunch! Paired with a sweet and spicy honey sriracha sauce, you can serve it as either an appetizer, breakfast or lunch! Pour oil in a large, deep skillet to a depth of 1 1/2". Preheat over medium heat to 375 F.
In a wide, shallow bowl, add the flour, salt, sugar, pepper and oregano. Whisk to combine. In another wide, shallow bowl, beat the eggs with approximately 1 tablespoon of water. Dredge the chicken in the flour mixture, then the beaten egg, then back through the flour mixture. Set aside until you have enough for one single layer in your oil (usually only 3-4 thighs). Carefully add the chicken to the oil, taking care not to crowd them in the pan. Cook until the chicken has turned golden brown (~5 minutes), then flip them and cook for another 3-4 minutes until the back side is brown as well. Remove from oil to a plate lined with paper towels and repeat the dredging and frying with your remaining chicken. In a small measuring cup, measure out your honey. Stir in the sriracha until even throughout. 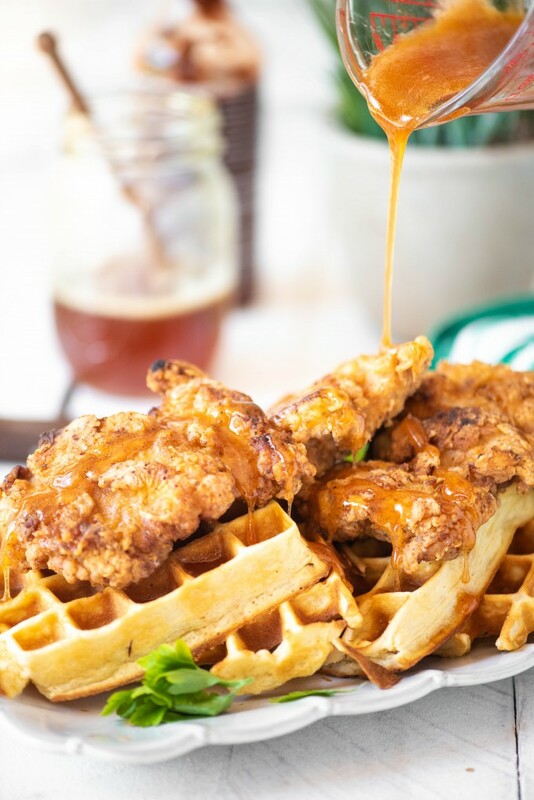 Serve waffles topped with chicken and drizzled with honey. You are speaking (no maybe yelling) my language. I love chicken and waffles with the fire of a thousand suns! And these are beyond! I mean honey sriracha? YES! YES! YES! 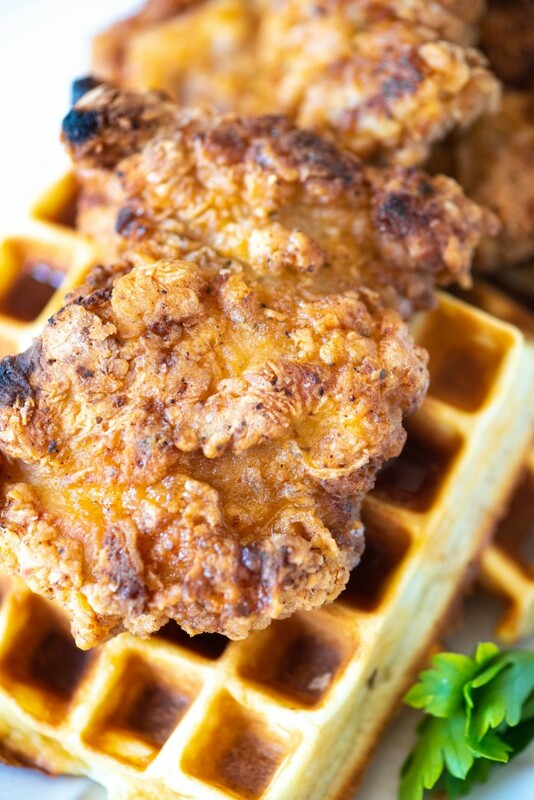 I love the combination of chicken and waffles! Can I make this a day ahead? Thanks! I love that sweet and spicy combo! So delicious! The flavor in this recipe is off the charts! It’s everything I expected and then some!